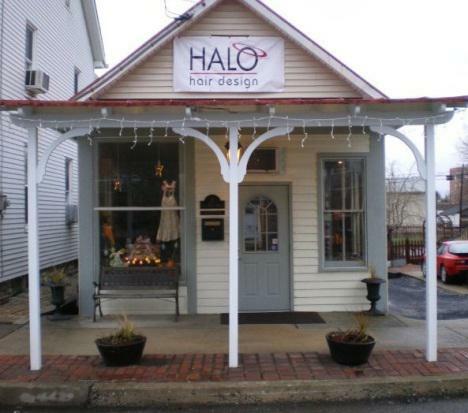 Kelly Deardorff was six when her family moved to Shiremanstown—the “best years of my life” growing up in “the most wonderful spot on Earth.” At 38, she’s front and center to the borough’s revitalization movement owning a home and a new business at 17 E. Main—Halo Hair Design. With hubby Anthony Palumbo, they head revitalization’s Business Development and Recruitment group. She only has to look back to appreciate Shiremanstown’s potential. She walked to Shiremanstown Elementary School and recalls that first day taking a bus as “traumatic.” It was fun when the Revitalization Committee held one of their meetings at the old school—now River Rock Academy. Downtown has changed a lot—gone is the fireman’s carnival, the pharmacy at Railroad and Main (Stoyer’s, Daniel’s) where kids’d make a trip to consider candies to buy, and Tom’s Place where WWII is now—popular for “eat in” and “take out” food…then, somewhat a novelty. Gone is the grocery on Main and the bank which now houses, in a strange twist of fate, a collection agency. Kelly Palumbo would tell you that while much has changed, Shiremanstown is still a great place to live, work and raise a family. That’s why she chose to come full circle and return to her roots (there’s a hairstyling joke in there somewhere). Since early 2009, the Palumbos have spent countless hours readying Halo moving the business from Lower Allen to Shiremanstown. Neighbor Lucy Getz says Palumbo is a planner, concerned with each and every detail of the transformation—and it shows in how she’s rendered the shop so welcoming inside and out. You walk in and leave your cares at the door—it’s that comforting. Built in three phases, the front or original Pump House is a reception and retail area. The middle dates to the early 1900s. It’s where you start your styling journey with a shampoo or other services. Then, off to the sunny back room circa 2001 for cuts, styling, the works. She kept her customers in mind too—six added parking spaces behind and a building that’s ADA-accessible. She plans to turn the front into a boutique of sorts with eco-friendly and organic lines—hair, styling, beauty and skin products. Also recycled jewelry, eco soy candles (which you experience while there), accessories like wallets, handbags and totes and small home décor items. There’s the wildly popular organic candy—sounds weird, taste GREAT!—and beautifully crafted products from Shiremanstown’s Colonial Yarn Shop…scarves, hats, gloves. She’s passionate about recycling and hopes to offer a recycling area for CFLs and other products. “Halo recycles everything—foil, bottles, bags, magazines, everything!” She’d like to couple her business interest with her commitment to recycling—like $1 off your bill if you recycle a bulb. “If a customer visits every four weeks and recycles a product each time, that’s a big improvement if they’d normally throw it away.” It’s her way of saving the earth, or at least Shiremanstown, a step at a time. With Halo, she’s settling in a little—well sort of. She doesn’t seem the type to every really rest. But she is comfortable, delighted to be back home in Shiremanstown and anxious to make the most of revitalization. For her, it all started with a little dream and digging in. “People don’t realize how hard it is to start and grow a business—what it takes.” She’s confident that the borough, the community at large and businesses all working together will make it easier, and better, for those who follow. And on a personal note, she’s really just getting warmed up! Hello! I’ve been reading your site for a long time now and finally got the bravery to go ahead and give you a shout out from Dallas Tx! Just wanted to say keep up the fantastic job! Thank you so much for the follow and we really appreciate such wonderful feed back! Hello, Thank you so much for the input, I Will be sure to look into it!